Music that I create and my opinions about music. Computer/Electronic music is the main interest. 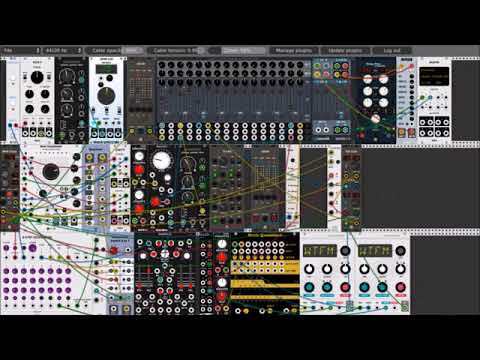 I was experimenting with the VCV Rack modular synthesis software, when it started making sounds at me that I thought similar to whale songs. I couldn’t resist putting this together. It also contains some interesting generative drums. It is already on my bandcamp store and has been uploaded to my distributor. It should be available on Spotify, iTune, Google Music, Apple Music, Amazon Music, etc. in about a week. Two albums in one month. Very exciting. With this release, I have finished putting my 2018 production out there for sale. It is all very different from my previous work. This album is called Meditative and it is. Quite ambient, downtempo. I hope some of my readers like it! Today, I issued the first album that I have issued in well over a year. It’s very exciting. All who know my work for the past year will realize the this is Modular Synthesizer generated, experimental music. Some of it is pleasingly ambient. It has been uploaded to a distributor and will soon be available on Spotify, iTunes, Apple Music, Google Music, Amazon Music and many other online sales and streaming services. It seems like December was a productive month for me. I have created and released two more generative pieces of music. Hope some of it is inspiring. “A Bit of Chaos” below was actually released today (New Year Day). It originally was just and experiment with various plugins that I had not used. It evolved into something that I rather like. “Experiment 8” published 4 days ago was another experiment that developed into a finished piece. This stuff is very much fun! I have created two pieces of music since my last blog post. As usual, these resulted from experimenting with new plugins in VCV Rack. The first is a piece that I am very proud of. It has gotten good feedback from both musicians and public. My goal was to produce a good piece with minimal plugins. It evolved into something pretty striking, I think. The next piece, I just uploaded today. Again learning plugins that were new to me plus adding in some vocals which I had not done in VCV Rack. It’s interesting. See what you think. It moves along pretty well! Happy Holidays to all and may we all have the best possible outcomes. You know that I like making modular synthesizer music and you know that I like meditation. What better than a meditative piece of electronica? This is a generative piece which means the notes are all generative randomly. As the notes are generated, I push them through a quantizer to get them to a musical scale (in this case F# Locrian scale). Then they go to VCOs (voltage controlled oscillators) which actually generate audible sound and then through an envelope generator which shapes the sounds. Finally all goes to a mixer and though a delay and a reverb to make the final product.